Hedge fund titan David Einhorn has just given the ultimate Yelp review. The closely-followed hedge fund manager and founder of Greenlight Capital disclosed a new position in Yelp's stock, and the shares are already trading higher. “We purchased Yelp (YELP) at an average price of $21.16. YELP is a dominant search and review website for local businesses with roughly 200 million unique monthly visitors and the 21st most popular mobile app in the U.S. 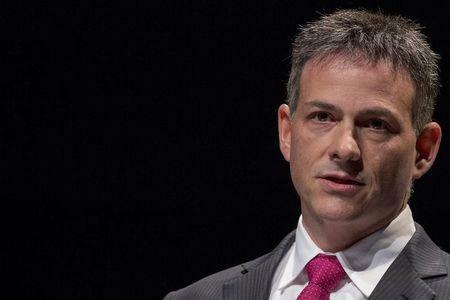 The stock has suffered due to missed expectations and anxiety about an upcoming negative documentary,” Einhorn wrote in an investor letter dated May 2 obtained Yahoo Finance. Einhorn appears to be referring to "Billion Dollar Bully," which according to IMDB takes "an investigative look into accusations that online marketing giant Yelp! is running a mob-like extortion racket against business owners who refuse, or can't afford to pay-to-play." Yelp’s stock was not one of Greenlight’s winners in the first quarter. The stock ended the quarter at $19.88 per share. Einhorn says he still rates the stock "five stars." That said, Einhorn believes that the company has the potential to double its revenues by 2019. He also thinks there could be the potential of a bidding war for the company if it decides to sell itself. “YELP is adding more transaction-based revenue, gradually relocating its salesforce to lower-cost cities, and providing more reporting tools to its customers to better illustrate the robust ROI of dollars spent with YELP. If the company executes its current plan, by 2019 it will double revenues and earn $300 million of EBITDA at a 35% margin,” Einhorn wrote. As for that documentary movie, Einhorn does not seem worried about its contents. Shares of Yelp were last trading up more than 4.4% in the after-market hours. The stock closed up 2.43% to end Monday at $21.51 per share. Greenlight Capital was up 3% for the first quarter. It’s a bit of good news for the fund which fell 20.2% in 2015. Einhorn's only previous down year was in 2008, when his fund lost around 23%.